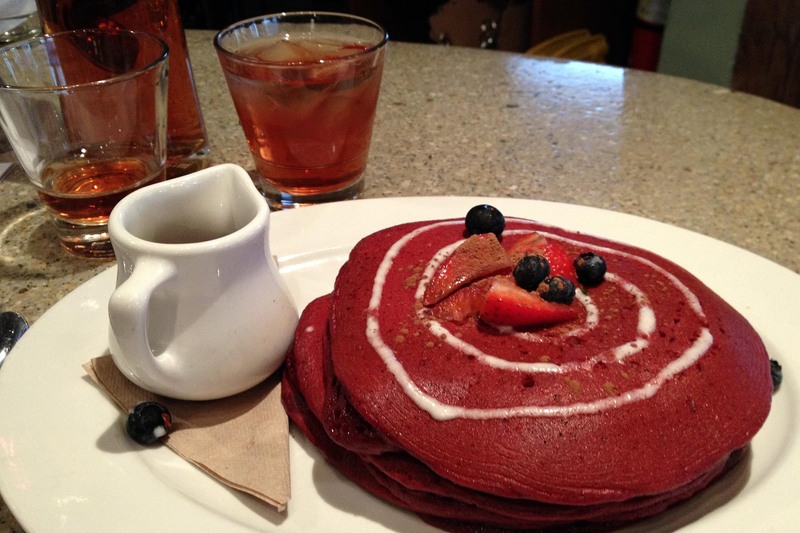 who wouldn’t love red velvet pancakes for brunch? It’s kind of obscene how much I think about food. While working, watching sports or television and even when I am working out, I am thinking about food. Not necessarily what I am going to eat. Sometimes that is the case, but other times it might be what I should eat because I am not hungry and I have to eat so that I can keep running. Other times, I am brainstorming about how I can make an interesting dish. Or in reality, how I can make myself a feast for lunch. Last year, I went to see a nutritionist. I wasn’t eating too badly, but at the same time, I wanted to do it better since 1) I am a vegetarian and 2) I was concerned that I might not be getting enough of certain nutrients. Secondarily, I wanted to lose weight and while I was already pretty good about doing the working out thing, I knew that ultimately, I needed to change how I ate to really make that goal happen. Seeing the nutritionist was the best thing that I could have done for myself. I met with someone who was okay with me not liking certain foods and not forcing me to eat them because “it is what vegetarians should eat.” She also was very helpful in helping to understand that and look at food as a way of fueling my body to do what I wanted.